So you are now set. All your marketing strategies are in place. Your web pages are getting lots of hits with thousands of visitors generating traffic towards you. But you are wondering, why is this still not translating into the monetary gains that you would expect? Well, this may be because you are not doing enough to follow up and engage your customers. A Conversion landing page will ensure that you better engage with your clientele and consequently get better results in terms of monetary gain. Did you know that? The numbers have said it all. So how do you design your landing page to be focused? For this, you need to ensure that your landing page is open for direct interaction with your customers, make sure that your landing page is extremely easy to navigate, make your homepage open while increasing the ability for your clients to search in your store and make sure to give as much information as possible in your product pages. And this is how you do it. Online shopping is similar to in-store shopping and just like in in-store shopping, some customers might just want to window shop while others may want to talk to the attendants. For starters, make sure to use” you” in your writing so that the customer identifies that you are talking to him/her individually. Use language and images in your landing page that your customer relates to. This will further make them feel that your product or service is intended for their personal use. This will aid you in providing this easy interaction. Here is how. Ensure that you are always in the know especially regarding the important pages on your online shop. This will aid you to properly understand the needs of the customers. With the feedback you get from this survey, you are then able to modify your store to your customers’ preferences. This is bound to ensure that the probability of getting more hits and more customers is higher. Some services allow you to integrate surveys into pages on your website. Survey your clientele and maximize on their numbers to make as much conversation as you can. Take advantage of the numbers to increase chatter on your page. This is an easy and focused way to collect information on the clientele. It is also a good way to get any other information concerning your products that may not have been previously taken into account. It is recommended that you use survey tools if possible to get a better understanding of how to ask the right questions. Additionally, they can provide useful information on client’s feedback. You can consider using an interactive platform that allows you to openly communicate with your clientele. This will give you the opportunity to discuss and receive suggestions and comments on your products. It is also prudent to follow up on any mention of your products or store on the social media to see how you are being mentioned. This will enable to immediately react to any customer queries or complaints and consequently improve your customer service. Reliable customer service is always a crowd puller for any business. As a way to improve credibility, you may opt to use social proof. This can be done by mentioning the number of customers you have or the number of hits on your page comparing it to pages with lesser numbers. This will make you seemingly more credible than your counterparts. This is the most effective way to converse with your online clientele in real time. It increases customer service because it is a good way to identify concerns, complaints and issues and immediately respond to them. Live chat also increases the bonding between you and your client which can lead to greater loyalty. It makes each client feel special as you take your time to address their issues personally. It gives the best feedback and instantly. Though some may look at this as a way to broadcast the shortcomings of your product, it is actually a way for you to identify the shortfalls that you need to address. Make reviewing easy and especially ask for reviews from customers who have purchased your products. Maximize the positive reviews as a marketing tool for your products. Research shows that 79% of buyers will believe personal customer reviews just as they would believe referral from friends and relatives. Do not be shy to share information with your customers as this provides an invaluable way to build brand/ customer trust. The objective of having website navigation is to allow easy accessibility. This is best done by ensuring that your navigator allows quick searches. This will go a long way in helping you establish your demographics. You need to know your customers. Who is it that you are marketing to? This means that you have to use various analytical tools to find the links that the customers find most useful and link those within your site navigation. Tools provide an accurate way of understanding clientele. Thus it is advisable to use tools to properly understand the customers shopping traits also referred to as heat mapping. Please do not assume. Use tools and any additional information about your products or store on the net to maximize on getting clientele. Analyze all the information that you have to ensure that any hits on your store or products can be categorized according to your clients’ queries. Then ensure those categories are put at the front and centralized. It is advisable that you get a tool to help you in this categorization. Make sure that the categories arranged in a logical manner. The most recommended way is to arrange the categories with the most liked first and work downwards to the least popular. This means that any time a client clicks on the site the most popular categories will pop up first. Alternatively, you could consider arranging the categories alphabetically. Visual hierarchy is important to help the shoppers decide the most important elements. Make sure the most important elements stick out. This can be done in several ways e.g. making them bolder, brighter bigger, or even employing the use of shadows to make them prominent. As much as possible use analytical tools that search the market to determine the products or services that are doing best. Then make sure to feature the best sellers in your catalog. Draw as much attention as you can to the top performers in your store by using banners and sliders. Additionally, try to include product recommendations in your catalog. Most clients look out for the best sellers and recommendations as they search. Statistics can prove very useful here. Use statistics of past success and highlight the benefits of your brand keeping in mind the customers tasted and needs. Adding an option for your clientele to buy the items on your catalog by just the click of a button will make it easier for the clientele. So be sure to add a link that leads straight to the checkout page so that shoppers can directly purchase from you if they are interested in your item. A carousel slider is a navigator that gives your shopper an opportunity to check out other interesting sections of your site easily. The sliders are usually updated with the latest trends and changes in the market and unlike the Navigation panels, they are ever evolving. and its also easy to add a slider in your home of wordpress. Do you have any additional information that may entice the shopper like a sale, discount, warranty, better shipping prices etc.? Make sure you call it out. It is pertinent that you place it on the home page and link it to the appropriate information page. Ensure that the CTA is distinctly displayed so as not to leave the shoppers wondering what they should click on. It is advantageous to use other visual cues like arrows or images to directly point to where the shopper should click. These directional pointers may also be done in the way you arrange your page to pull attention to the significant elements for maximization. In the days of the print media, above the fold meant keeping all the important information at the top half of the paper, above the fold, to maximize sales. However, with the advent of alternate media, the fold is not constant and variates according to the screen orientation. This means above the fold will mean prioritizing the important information high enough on the screen that a shopper does not have to scroll down to see it. Generally, people do not scroll down unless there is something very compelling to make then scroll down and even so they will not scroll too much. Any additional information below the fold should also have a CTA this is to make it very convincing for the shopper to click on it. First impressions are the last. And as far as landing pages go, the first 5 seconds will either draw in or push a shopper to move to the next page. So it is important to plan your page in a way that the first glimpse will give you all the relevant information. It should be attractive and appealing. Test your web page to have an understanding of how exactly your page appears. Some considerations here include testing the text color. Select the color that is most visible and attractive in comparison to the background. The size of the text will be determined by how distinctive you want the CTA to be. And button placement should be done to ensure it is easily spotted. Optimizing the page of your products is a sure way to pull in the traffic. There are several ways to do this including color selection, page layout, etc. A great product description makes a best seller. That is why if you want to increase sales make sure that you describe your products by highlighting the best features and functionalities attractively. Make sure to give short precise explanations on the product’s benefits to the shopper. Make sure it’s easy to peruse and add links to other relevant information. Here it is advantageous for you to subtly insinuate that your products are services are better than the rest of the market. Addition of trusted symbols will go a long way in improving credibility for your brands. Add some highly popular brand logos that you deal with. This will increase familiarity and confidence. Power words provide the relish to your products. So use them as much as you can to get maximum impact on your page. Be very cautious of creating duplicate pages of similar products with slight variances e.g. color, size, etc. Rather include all the variations of your products on one page. This will improve the shoppers’ experience. Alternatively, you could design your page in a way that allows the shopper to view images according to their selection. Alternatively, you could consider including an additional CTA with secondary offer(s). it could be that is just what they were looking for. More than 50% of shoppers say that a quality image is more important than product information, descriptions ratings and views. Good quality images have proven to be very effective in making the landing pages enticing. Chances are the better the pictures the more attracted the shoppers will be. Videos are the best way to show how the product operates and gives more details about the product. Research has shown that conversions increase by 86% when videos are used on landing pages (https://www.eyeviewdigital.com/documents/eyeview_brochure.pdf). So ensure to use videos on your page to maximize sales. There is nothing as off-putting to a shopper as searching for the price of products to no avail. Usually, most shoppers tend to deviate elsewhere if there is no clear indication about the price of the product he is interested in. Though the selling features of the service or product should be given priority, the price of the products or services must also be included. This is especially important for products that need measurements to get the right size for the shopper. There are several measurement tools that you can offer to your clientele to help them find the precise sizing or specification that they need. The charts and calculators hey greatly help to shoppers who may want to get details on sizes, fittings, shape and sometimes even shipping estimates. There are several universal and country-specific tools available in the market. It is important to have a stock inventory that will keep you updated on the stock movement. This is important because you will need to update your web page, especially on stock depletion. You should set it to notify you when the stock is almost finished so you could post the same on your page. This will enable the shopper plan his purchase. Preferably, link your stock inventory to your page so that it is always updated on the same. You may consider adding an option that allows you to email the shoppers when the item is back in stock. This will not only improve the customer experience but will keep the customer put until you restock and sell to them. To increase sales, you may user scarcity tactics like “Limited supply”,” only two left in stock”, “order now before stock runs out” etc. this will also go to show that the product is in great demand. Inaccurate searches prove detrimental to your business as it leads to lost customers translating to a loss of sales. So make sure that the shopper gets the most out of a single click. Here is how. Make sure that the page has an easy to find easy to use, clearly displayed function. It should be prominently placed to ensure the shopper has no problem finding it. To find out just how accurate the search function is, it is important for you to test it. Try searching for an item in your catalog by using both single and multiple words to see the information that it will yield. This will demonstrate how helpful the function is to the aspiring shopper. Design the page in such a way that any keyword entered will generate a series of similar recommendations for the shopper. This will give you an opportunity to advertise your other products or services. It will also improve the shoppers’ experience and help them easily find what they are looking for. Embrace the use of social media share buttons as search engines like Google “like” a highly shared page. Make the clickers prominently visible on your page to increase your social media presence and if you are feeling you need more suggestion on your business, read how to overcome obstacles to build a profitable online business. The main reason for all the effort in internet marketing is to ensure that customers not only visit your page but also give you some sort of feedback. That is why you need a landing page design that is conversion focused. 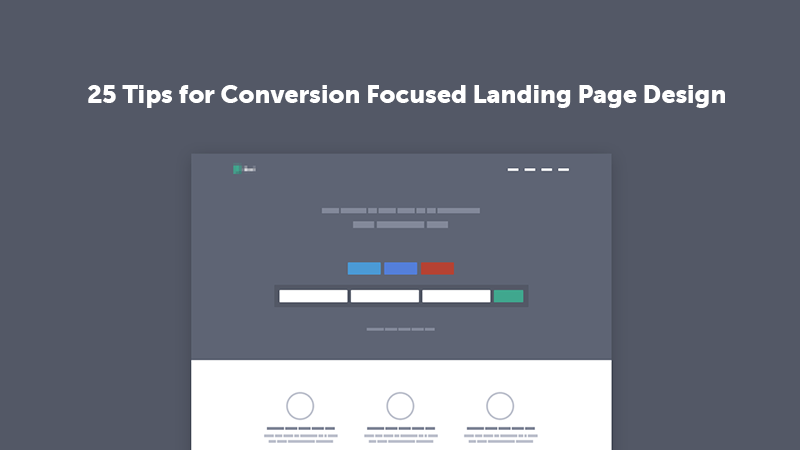 Having a conversion focused landing page is bound to make it easy and attractive for them to make a move when they visit your page. Here is some Landing Page design that may help you to create one. This will consequently lead to increase sales on your part. In summary, the first step is to be precise about what you want the aspiring shopper to do when he gets to your page. The final step is to make it as captivating as possible for them to take the bait hook, line and sinker. And this will give you a landing page that converts. It’s up to you to be creative. And be sure to test it. Chances are that if it does not capture your attention, it will not capture the attention of the shopper.